Mini 7s - Ár gCailíní! On the 8th of October Andrea, Alicia, Lauren, Jemma, Nicole, Ellen, Niamh, Aoife, Chloe G and Chloe L were playing in the mini sevens tournament. First they played against New Inn. It was a tough match but in the end they won by 3 goals and 2 points to 1 goal .After that they played Kilchreest. It wasn’t as hard as New Inn . But they played well. Kilnadeema also won that match. Then they had their lunches to refuel for the next battle. When they were finished they were ready to go again. This time they were against St. Itas. It was an exciting game and yet again we won scoring 6 goals and 2 points, another fantastic result. Then it was the semi-final against Peterswell most of the girls say this was the hardest one but yet again we came out on top. Now they were through to the day’s final against Bullaun and they were thrilled. This match was also very hard but they won 6 goals to 1 goal. Now our girls are through to the county final and we are all very excited. UP KILNADEEMA!!! 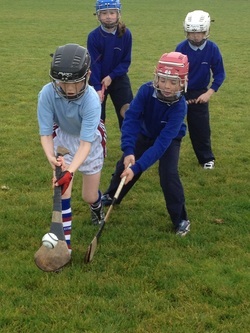 Last Friday, October 9th 2015 the boys hurling team went to Kilconieron. We met Kilcooley and we beat them by two goals and one point. Darragh played excellently as did Shane F and David. Then we met Tynagh who we didn`t play as good against. We lost by 1 point. Finally we played Leitrim. This was the semi-final. Darragh got a disallowed goal that would`ve won the match for Kilnadeema. In the end we lost by a point. In the final it was Tynagh versus Leitrim. Leitrim played well but not good enough. Tynagh won. Good day was had by all! Over the years, boys and girls in Kilnadeema National School have been very successful in Cumann na mBunscol competitions. Cumann na mBunscol is an organisation which works towards the promotion of Gaelic Games, Handball and Athletics, within Primary Schools throughout the country.To get an insight into the school's achievements have a look at the following link! Kevin returned to the school to coach our younger pupils!